The race for the Fall Meet champion jockey, trainer and owner will come down to the wire on the final day of racing at Churchill Downs. Tyler Gaffalione began Sunday atop the jockey standings with 20 victories and nine entries over Corey Lanerie (19 wins, nine entries), Brian Hernandez Jr. (18, nine), Edgar Morales (18, 11), Florent Geroux (15, nine) and Ricardo Santana Jr. (15, eight). In the leading trainer’s race, Dallas Stewart had a slender 11-10 win lead over Steve Asmussen. Stewart, who is seeking his first Churchill Downs training title, has two entries in Races 9 and 10, while 19-time local leader Asmussen has five horses entered in Races 5, 8, 9, 10 and 11. Also in contention for the leading trainer honors are Kenny McPeek with eight wins and four entries in Races 1, 8, 9 and 12 and Brad Cox with seven wins and four entries in Races 6, 7, 9 and 12. In the leading owner’s race, Loooch Racing Stables’ five wins put him two ahead of the closest competition of Ken and Sarah Ramsey and G. Watts Humphrey Jr. Loooch Racing Stables has one entry in Race 8 while the Ramseys have three entries in Races 4, 8 and 11 and Humphrey has two entries in Races 2 and 10. For the latest updates throughout the afternoon, follow @DerbyMedia on Twitter. Racing will resume at Churchill Downs on April 27, 2019 for Opening Day of the Spring Meet and there are only 160 days until Kentucky Derby 145. POOL 1 OF KENTUCKY DERBY FUTURE WAGER CLOSES SUNDAY – In the final day of wagering in Pool 1 of the Kentucky Derby Future Wager, the popular option of No. 24 “All Other 3-Year-Old Colts and Geldings” is the heavy 7-5 favorite over Breeders’ Cup Juvenile (Grade I) winner No. 6 Game Winner at odds of 6-1. The pool, which features $2 Win and Exacta wagering, will close Sunday at 6 p.m. ET. Other horses taking early action include impressive maiden special weight winner No. 3 Coliseum (8-1), Best Pal winner No. 9 Instagrand (10-1) and Street Sense Stakes winner No. 8 Improbable (16-1). Pool 1 past performances courtesy of Brisnet: http://www.brisnet.com/wp-content/uploads/2018/11/Derby19Future1.pdf . The Kentucky Derby Future Wager is being offered concurrently with the fourth annual Kentucky Derby Sire Future Wager, which provides bettors with a unique opportunity to wager on select breeding stars and their entire crop of juveniles with the hope of winning next year’s Kentucky Derby. “All Other Sires” continued to hold favoritism on Sunday morning at 9-2 over offspring sired by Candy Ride (ARG) at odds of 6-1. The Kentucky Derby Sire Future Wager will close at 6:30 p.m. EST. Sire Future Wager past performances courtesy of Brisnet: http://www.brisnet.com/wp-content/uploads/2018/11/DerbyFuture19SirePPs.pdf. Wagering on both pools is available on track as well as TwinSpires.com and other simulcast outlets throughout the country. For more information visit: https://www.kentuckyderby.com/wager/future-wager. DOWN THE STRETCH – Since Sunday is Closing Day of the Fall Meet, there are mandatory payouts in all multi-race wagers. The massive Single 6 Jackpot was hit by a TwinSpires.com customer on Saturday for $500,256.88. 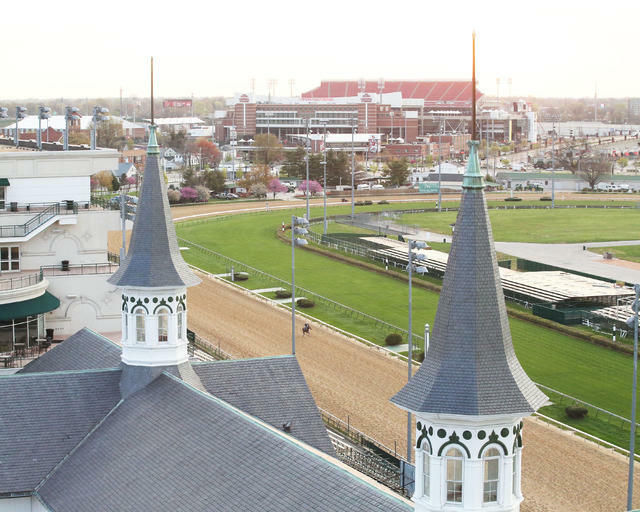 … Training at Churchill Downs will switch on Monday to a 6-10 a.m. EST schedule with one renovation break at 8 a.m.